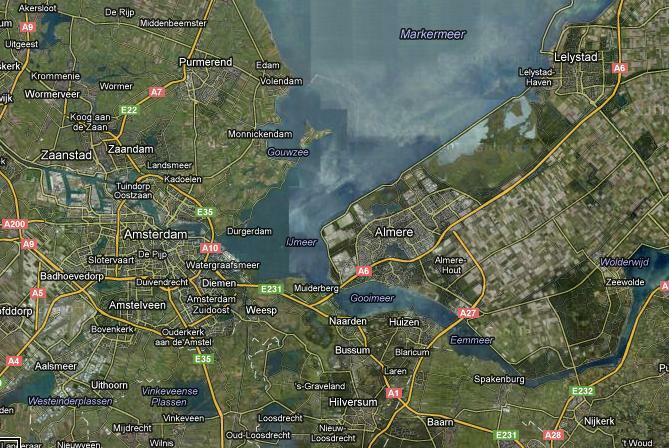 Dutch new town Almere plans to grow with 60,000 houses, 100,000 working places and all related facilities. 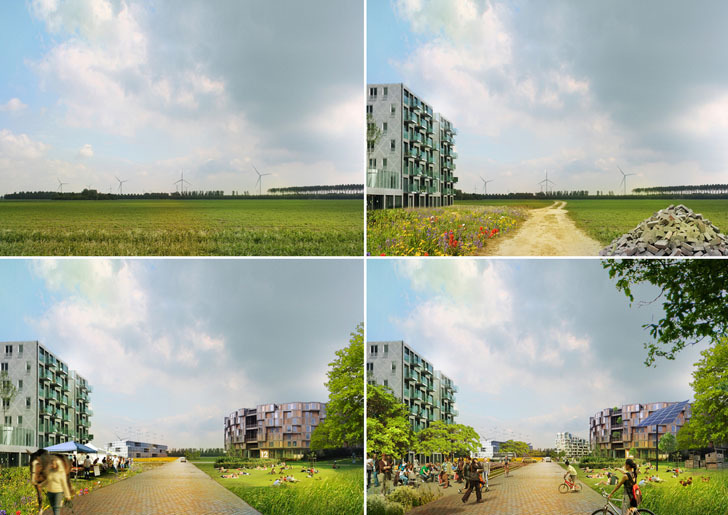 By this Almere will grow into the fifth city of the Netherlands in an effort to relief and to offer qualities to the urbanised west of the Netherlands. 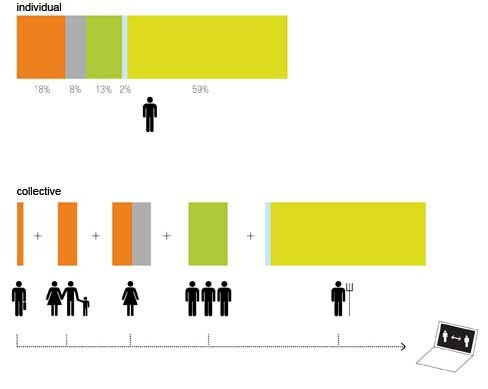 MVRDV was commissioned to collaborate with the city to design a concept structure vision to accommodate this growth. 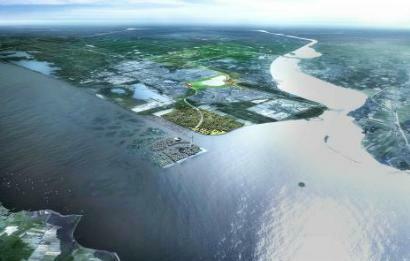 Almere IJ-land: Together with West 8 and William McDonough, MVRDV worked on the unique opportunity to design a series of urban and nature reserve islands. 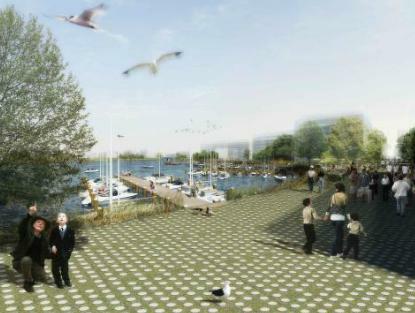 The new rail connection to Amsterdam and a needed ecological intervention in the IJ-lake offered the potential to propose the creation of a living area with 5,000 up to 10,000 homes, combined with this nature development. IJ-land combines ecological and infrastructural interventions with the possibility to live and work in a natural riparian environment. 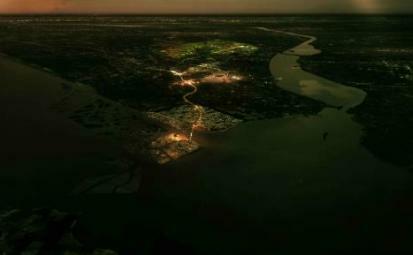 The island could also be part of the possible Dutch bid for the 2028 Olympic Games. 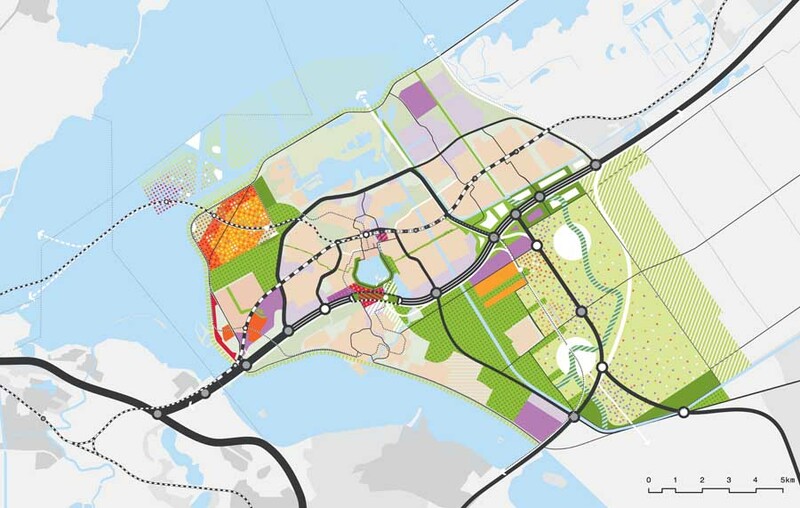 Almere Pampus: This area will combine the feeling of a coastal town with high density and make room for 20,000 homes, all streets are all leading to the boulevard at the lake. 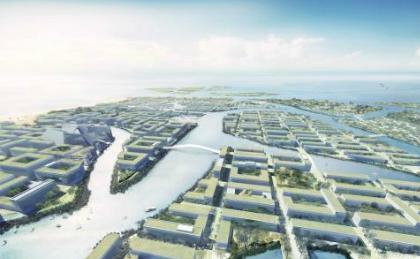 The existing maintenance harbour will be reused for leisure and floating villages. There will be a new train station with a plaza at the coast. Almere Centre: The current centre will grow and extend to the southbank of the Weerwater , turning the central lake into the Weerwater-park and becoming in time the cultural and economical heart of the city. On the junction of the new axis, a motorway and the rail connection the motorway will be covered which makes it possible to develop up to 5,000 homes, offices and public amenities. The central station will be developed into an economical hub and will be surrounded with new program. Oosterwold: This large area in the east offers room for up to 18,000 new homes and a variety of functions such as business and retail centres. It will be developed following individual and collective initiatives, from small scale to large scale, with plots that are always surrounded by nature development, urban agriculture or local parks. The area will reserve areas for future development after 2030. Together the proposals form the new framework to accompany the growth of the city until 2030. Together with the entire board of city councilors and the mayor, Adri Duivesteijn, city councilor of Almere and Winy Maas of MVRDV, presented the concept structure vision to the ministers of Transport, Public Works and Water Management (V&W), Camiel Eurlings and minister of Housing, Spatial Planning and the Environment, Jacqueline Cramer (VROM) on June 26th. The design of IJland has been a collaboration with Adriaan Geuze of West8 and William McDonough of McDonough and Partners. Winy Maas, Jacob van Rijs en Nathalie de Vries with Jeroen Zuidgeest and Klaas Hofman, Martine Vledder, Sabina Favaro, Hui Hsin Liao, Francesco Pasquale, Fokke Moerel, Paul Kroese, Johannes Schele, Stefan de Koning, Oana Rades, Silke Volkert, Fabian Wagner, Wouter Oostendorp, Marta Pozo,Naiara Arregi, Jaap van Dijk, Marta Gierczynska, Daniel Marmot, Pablo Munoz Paya, Di Miao, Manuel Galipeau. Publicado por ekuazion en 8:49:00 p. m.